“Cabernet Franc is about to become one of the world’s great grapes,” says Thierry Germain, owner/winemaker of Domaine des Roches Neuves in Saumur-Champigny. He’s right. It’s a great time to enjoy Cabernet Franc from the Loire. The grape yields so much more than light, easygoing selections to sip young or even slightly chilled. Today, the wines are increasingly rich, vibrant and long lasting. A succession of superb vintages (2014, 2015, 2017 and 2018) has only helped solidify the idea that Cabernet Franc bottlings from the central Loire Valley deserve to be taken seriously. Four appellations, often organic or biodynamic, are the heartland of this transformation: Saumur-Champigny, Chinon, Bourgueil and Saint-Nicolas-de-Bourgueil. These appellations produce red wines made from Cabernet Franc that are increasingly impressive. They offer smoky perfumes, rich berry fruits and fine structures. Cabernet Franc was first planted in the central Loire Valley more than 700 years ago. Vineyards now stretch across its bucolic appellations, lining the slopes that face the Loire and Vienne Rivers from the fairy-tale castles of Saumur, in the west, to Chinon and close to Château d’Ussé, the inspiration for Disney’s Sleeping Beauty castle, in the east. It’s unclear why Cabernet Franc was chosen or became widely planted because, for centuries, it didn’t ripen beyond 10 or 11 degrees of alcohol. Regardless, today’s selections can now naturally reach up to 13.5% alcohol by volume, which results in wines of greater color, concentration and complexity. Dive in to these four appellations and experience Loire’s golden age of Cabernet Franc. Saumur-Champigny is a dynamic appellation made up of 3,900 acres just southeast of the castle town of Saumur. It exhibits the enormous change that Loire Valley Cabernet Franc has undergone over the last 25 years. Once the source of low-alcohol wines for Paris bars, Saumur-Champigny now produces rich, pure expressions with complexity allied to wonderfully pure red-fruit cores. In 2017, the iconic Clos Rougeard estate, including its 25 acres in Saumur-­Champigny, was sold to telecom tycoons Martin and Olivier Bouygues for roughly $17 million. It was a reality check for growers throughout this small appellation. The Foucault family, which previously owned the estate, had built a formidable reputation for their biodynamic wines. They left behind disciples like Thierry Germain of Domaine des Roches Neuves and Matthieu Vallée of Château Yvonne, both of whom also work biodynamically. Germain, originally from Bordeaux, is now one of the high priests of French biodynamie. His passion is coupled with practicality: His nearly 70 acres of vineyards are densely planted and only plowed using horses, and all the vines come exclusively from his own nursery. He has 14 employees, one for every five acres, and a goal to produce intensely fruited, well-structured and ageworthy wines. The vines of Roches Neuves, divided into 61 parcels, are spread from the northern boundary of the appellation, with its sharp drop to the Loire River, to the southwest edge of the plateau, which slides gently into the Thouet Valley. Philippe Vatan of Château du Hureau, on the other hand, illustrates how even the most established producers have changed. No newcomer to Saumur-Champigny, he’s a fourth-generation winemaker whose daughters, Lisa and Agathe, are poised to carry on the family tradition into the next generation. The château is perched on a ledge above the Loire River, with a spectacular cave for wine production created by quarry stone. Some 30 years ago, the wines were well made, but light and for early enjoyment. “I can tell you that with climate change, it’s getting ripe more regularly, so no need to chaptalize,” says Vatan. Hureau’s wines like the Les Fevettes, from 75-year-old vines, and Lisagathe,­ named after Vatan’s daughters, are ripe, dense and aged in wood. Produced from organically grown grapes since 2009, they celebrate Cabernet Franc in all its ripe, rich glory. Domaine des Roches Neuves 2017 Les Mémoires; $68, 94 points. Sourced from a vineyard at the highest point of the appellation, close to the village of Dampierre, this is a serious, concentrated wine. It’s dense, with layers of black cherry fruits, rich tannins and acidity. Wood-aged in massive 660-gallon barrels, it has a firm structure, which will allow it to age well. Drink from 2022. Kermit Lynch Wine Merchant. Château du Hureau 2015 Lisagathe; $40, 93 points. Named after fourth-generation winemaker Philippe Vatan’s two daughters, Lisa and Agathe, this wine is produced only in top vintages. It comes from selected parts of the estate’s best vineyards, located above the underground cellars. It’s ripe, warm and generous, with a dense texture and rich fruits. It’s almost ready to drink, but wait until 2020. Charles Neal Selections. Famille Duveau 2016 Cabernet Franc; $22, 89 points. This fruity wine is full of ripe red-cherry flavors, with a touch of smoky tannins. It has a delicious, juicy character, very open while also having a balanced structure. From vineyards to the east of the city of Saumur, the wine is bright and ready to drink. Franck’s Signature Wines. Chinon’s wines are about power and richness. At their best, they have depth, concentration and sometimes astonishing ageability. But, with approximately 5,700 acres of vineyards, Chinon is also the most variable of the four Cabernet Franc appellations, if only because of its size. Within the appellation, three distinct areas produce differing styles. 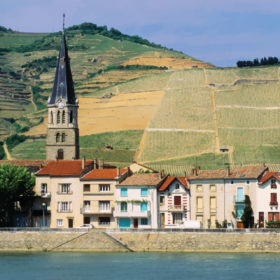 The two banks of the Vienne River, centered on the fortress city of Chinon, produce the most structured selections. The right bank of the Vienne is home to many of the top domaines, like Château de Coulaine, Domaine Bernard Baudry and Domaine Fabrice Gasnier, as well as major négociant and estate owner Couly-Dutheil. On the left bank, a smaller vineyard area has two top domaines: Domaine Charles Joguet and Domaine de la Noblaie. Farther west, on the Véron peninsula where the Vienne meets the Loire River, sandy soils and a flat plain produce generally light, fruity wines. However, there are fine producers like Domaine Olga Raffault, run by third-generation Winemaker Sylvie Raffault and her husband, Eric de la Vigerie. The domaine, owned by the Billard family, is in a quiet, isolated valley in the hills south of the Vienne. It’s an organic estate that’s full of vines up to 60 years old. Visitors can ascend a steep stepladder to peer into a cave that houses a circular stone fermenting tank. It’s used for the estate’s top wine, Pierre de Tuf, which exemplifies how well Chinon can age: The 2005 bottling, still rich and full of fruit, has just started to approach maturity. Domaine Olga Raffault 2014 Les Picasses; $30, 94 points. Chalk soil on the slope up to the plateau above the town of Chinon gives this organic wine its mineral texture, which is allied to great fruit and spice. Wood aging lends generous, ripe tannins, the layers of black fruits are impressive and have aged well. Enjoy this fine wine now. Louis/Dressner Selections. Couly-Dutheil 2015 Clos de l’Echo; $35, 92 points. This producer’s top single-vineyard wine is richly structured and full of ripe berry fruits. A strong smoky character comes through the rich fruits and acidity to produce a classic Cabernet Franc flavor. It’s still surprisingly young, and will be better from 2020. Cynthia Hurley Wine Imports. Domaine de la Noblaie 2016 Les Blancs Manteaux; $20, 90 points. Named after the pale cream-colored chalk soil of the vineyard, this wine is full of fruit, but also with plenty of structure that will allow it to age well. Blackberry fruit tones are shot through with acidity, and it finishes with spice and a tangy structure. Drink from 2020. Jon-David Headrick Selections. Bourgueil is all about a slope and a plain, which correlate to structure and lightness. The two sides to this appellation can often be apparent in wines from the same producer. Those from the chalk and clay slopes show off the structure and aging potential of Cabernet Franc. Conversely, wines from the gravel plain, which extends two miles away to the banks of the Loire River, are lighter in feel, with fruity freshness. Take the wines of Catherine and Pierre Breton, who farm their vineyards biodynamically. They have a perfumed, light-hearted bottling named Trinch, produced from the gravel soils of the plain. As a contrast, their top selection is from the slope, the coteaux, named after one of Bourgueil’s best vineyard site, Les Perrières. It’s aged in wood for up to 24 months, depending on the vintage, and packed with tannins when young, but develops into a ripe, spicy wine as it matures. Even producers who have only vines on the slope notice differences between vineyard sites. Midslope is best, according to Jacky Blot, who owns Domaine de la Butte. He came to the area from the Chenin Blanc vineyards of Montlouis and Vouvray with a desire to produce red wines solely from vines grown on the slope. Then Blot went deeper. He looked at the differences between the top, the middle and the base of the incline. He decided to produce three wines: Le Haut de la Butte, Mi-Pente and La Pied de la Butte. The Mi-Pente, or “midslope,” is the most structured and ageworthy, while La Pied de la Butte, from the foot of the slope, is the smoothest and freshest, full of bright red fruits. There’s much history in these Bourgueil vineyards. Cabernet Franc was first planted here by the monks of Bourgueil Abbey during the 10th century, possibly brought up-river from the port of Nantes and originally from Bordeaux. The abbey is still standing, with a walled Cabernet Franc vineyard, Le Clos de l’Abbaye, one of the oldest vineyards in the Loire, to the side. Domaine de la Butte 2017 Mi-Pente; $40, 94 points. The name Mi-Pente means “midslope,” and this is considered the best point of the slope, neither too high nor too low. The wine is bold, dark and very rich. Black currant and berry fruits are prominent, as are the tannins that will allow this fine wine to age. Drink from 2023. Skurnik Wines, Inc.
Alliance Loire 2017 Domaine de Chanteloup Vieilles Vignes; $20, 90 points. This wine comes from old vines on a 27-acre family vineyard. It’s a generous, concentrated wine with firm tannins, as well as blackberry flavors. It’s smoky, richly fruited and structured, and it’s likely to age well. Drink from 2020. Fruit of the Vines, Inc.
Domaine les Pins 2017 Le Clos; $30, 90 points. This ripe, smoky wine is all about attractive fruit and soft tannins. The fruit, expressed in flavors of fresh red berries and cherries, is still young and developing, with intense acidity. Wait until 2020 to enjoy this attractive selection. T. Elenteny Imports. A mad dash around the vineyards of Saint-Nicolas-de-Bourgueil in Xavier Amirault’s battered white van reveals an appellation with a distinct personality. It’s by no means an afterthought to neighboring Bourgueil. The vineyards of Saint-Nicolas are mainly on the sand and gravel alluvial plain of the banks north of the Loire River. These sites produce the lightest style of Cabernet Franc from the four appellations. They’re wines for pleasure, but their lightness doesn’t make them less worthy of attention. Domaine Amirault’s 58 parcels, all farmed biodynamically, are scattered across the appellation. Some are close to the Loire, while others are on the deeper gravels that give way to the small portion of the slope that runs through Saint-Nicolas. A few are on the slope itself, including vines that cover the family’s cellar full of old bottles, which is reached by an almost invisible green door in a bank, like a Hobbit dwelling. While Amirault doesn’t mention the importance of vineyard sites, it’s highlighted by three of his wines. Le Val Renou, from the chalk and clay slope, and Le Fondis, from a deep gravel layer spread over a clay base, are structured. Les Gravilices, from deep gravel on the plain, is balanced and full of cherry and plum flavors. Around the corner from Amirault’s Clos des Quarterons is the cellar of Frédéric Mabileau­, who has farmed his nearly 70 acres of vines biodynamically since the 2018 vintage. The change of wine style in this appellation and throughout the Loire is a common theme. Mabileau’s eyes were opened by the 2005 vintage. Mabileau’s story is like the journey taken by so many of the top estates in this corner of the Loire, one that has put Cabernet Franc on a different, exalted level. Xavier et Agnès Amirault 2015 Le Fondis; $44, 93 points. Produced biodynamically from clay and gravel soils, this single-vineyard wine is richly endowed with firm fruits, ripe tannins and fine berry flavors. Wood aging has added a touch of spicy complexity. Drink from 2022. Vineyard Brands. Frédéric Mabileau 2015 Les Coutures; $30, 92 points. This is a lightly wood-aged wine. It has a smooth texture to go with the rich blackberry fruits and acidity. Fine perfumes and a dense texture from the old vines are now showing well, so it can be enjoyed now. VOS Selections. Pascal & Alain Lorieux 2015 Agnès Sorel; $45, 91 points. This is a ripe, smoky wine, with soft tannins and swathes of red fruits. It is still young, with a stalky character, but it will fill out as it matures because the weight and the tannins are very present. Drink from 2020. It is named after a mistress of King Charles VII of France. Serge Doré Selections.